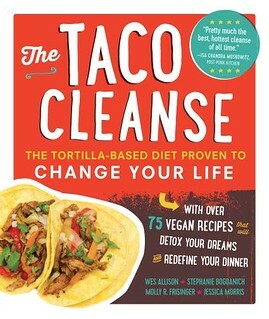 Congratulations to the Vegan Yacht for winning “Flo’s Fabulous Food Truck Contest” and a $10,000 prize! 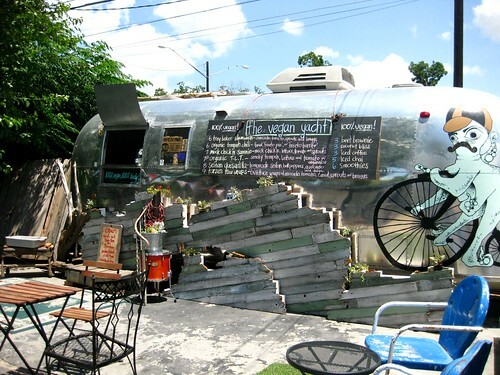 I remember when I first went to the Vegan Yacht five years ago when it was parked behind Cheer Up Charlie’s when they was still on east 6th street and it looked like this. I was so happy to have another vegan food cart in town and I’ve watched them grow and relocate as the years have gone by. 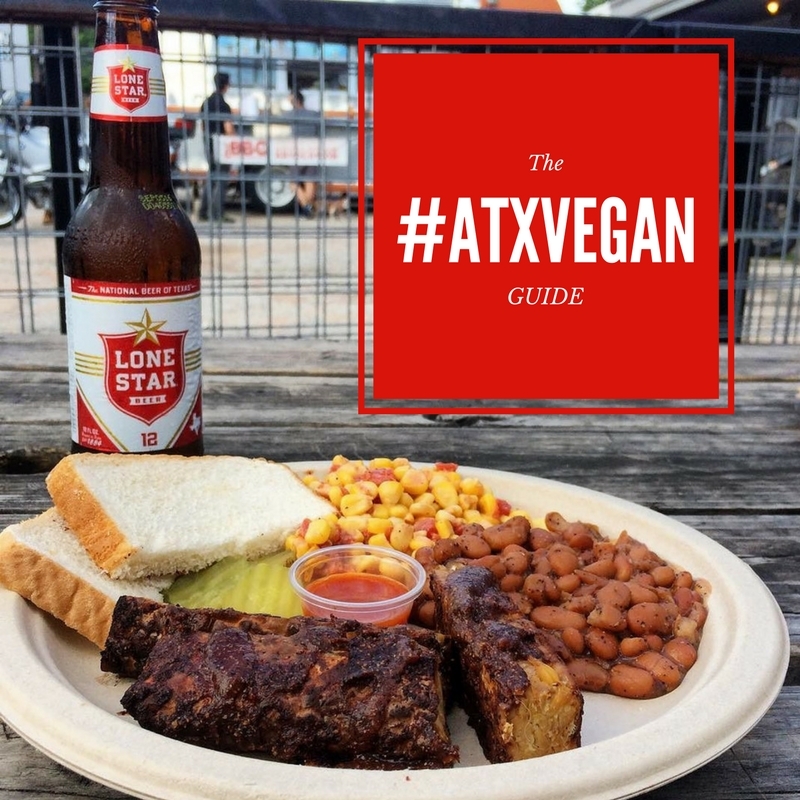 I’m always thrilled when I go to a festival in Austin and see the Yacht there because I know I won’t have to worry about getting ridiculously tasty vegan food and ask a million questions to other vendors. After dancing for hours at Fun Fun Fun Fest or Levitation Fest the Freeto Burrito is the perfect way to recharge. It was so sad to see their generator get ripped off a few months ago when they were doing what they do best, bringing vegan food to the masses. I thought, what is the world coming too when people steal a generator, a huge part of someone’s livelihood, at Zilker Park of all places? But then I was reminded that sometimes the good outweighs the bad. The community came to support the Vegan Yacht through a GoFundMe fundraiser and they decided they wanted to expand operations and applied for Flo’s Fabulous Food Truck Contest through Progressive. They won the Grand Prize by a LANDSLIDE and I’m so happy that this family business is going to get 10,000 dollars to further their dreams!!!!! 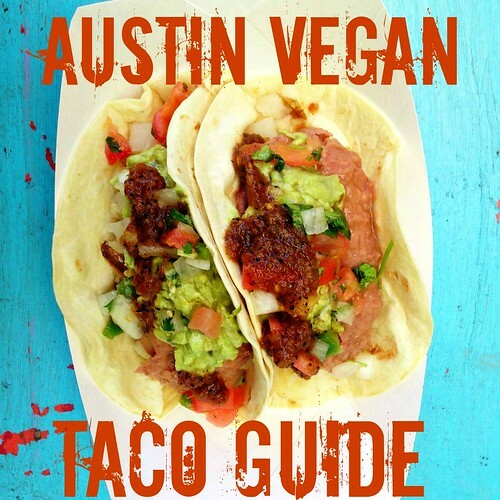 Their plan is turn the Vegan Yacht into a mobile food truck and use the existing airstream for a new second vegan food trailer totally different from the vegan yacht! Another all vegan food trailer! Huzzah! This Thursday, September 17 from 5:00 pm – 7:00 pm, Progressive is going to award them the big check at a party, come out and support the team!!!! To celebrate they are going to offer free homemade sweet and spicy jalapenos with any order. They look so damn tasty. Pickled Jalapenos make everything better!!! So be there and show your support for vegan businesses taking over the world! 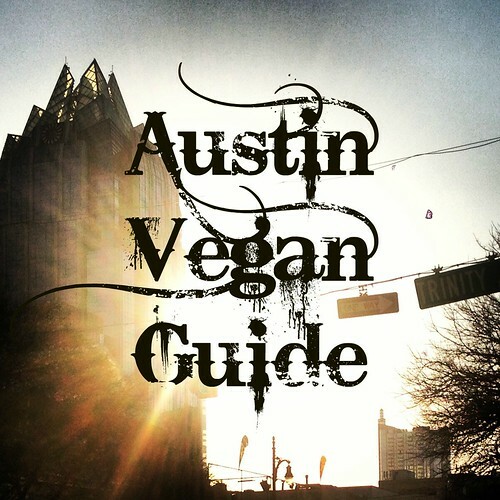 This entry was posted in Austin, News on September 15, 2015 by lazysmurf. The question that I get asked the most in Austin is where to go for fine dining. In the old days my best answer was the Clay Pit for Indian food and I stand by that recommendation. If you can get seated in the candlelit stone brick-walled basement you will have the great atmosphere plus excellent vegan friendly food. But, not everyone likes Indian. Sagra, which I wrote about last week, gets recommended quite a bit but it’s really a bit more casual and calls itself a Trattoria. Other spots like Lenoir and Second will make you an awesome vegan meal but you don’t know what you are going to get since there isn’t an actual vegan menu. It’s up to the chef which means you might have something you don’t like and that if you are dining with another vegan (or several) you will all get the same thing which isn’t as fun. 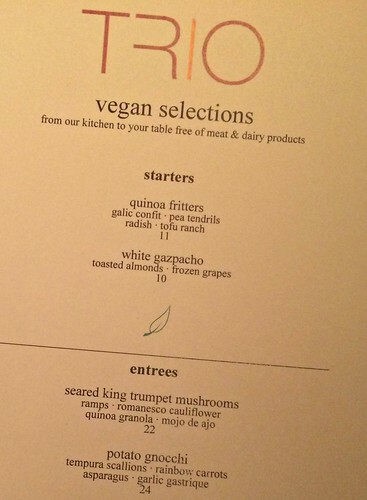 The other day someone posted on the Austin Vegan Facebook group that TRIO, a highly reviewed restaurant here in Austin inside the Four Seasons, had a vegan menu and I kind of couldn’t believe it. I mean, their tagline is steak.seafood.wine. Usually seeing steak and seafood featured at a restaurant means you better enjoy wine because that’s all you will be eating with your bread but look at this menu! Two entrees! Appetizers! OMG! 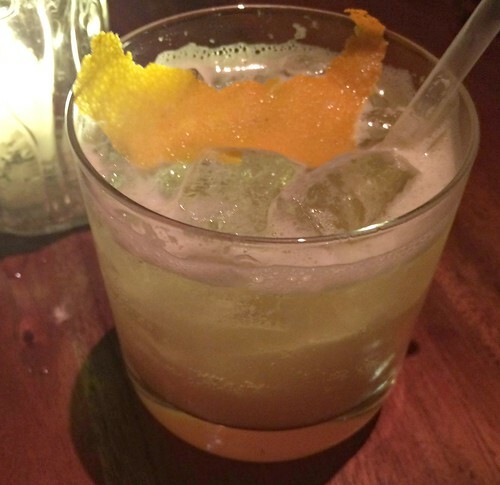 I made reservations minutes after seeing the post and one week later I was sitting at a table holding the menu in my hand enjoying a fantastic cocktail, The Buffalo Solider, Orange Zest, House Infused Buffalo Trace, Cherry Heering, Earl Grey Syrup, and Mineral Water. It was maybe the perfect summer drink. The restaurant itself is very lush although the clientele definitely seemed more of my parents generation than mine. That could very well be because of the weekend I went, I’m sure that it changes around depending on who is in town for what event since it’s at a hotel. They had a huge patio as well that overlooks the lake but we chose to sit inside in the dark yet sunshine toned dining room. Our waitress was maybe the best most helpful waitress that I’ve ever had. As soon as she found out I was vegan she started excitedly telling me about the menu options and told me she preferred the vegan gnocchi to the one on the regular menu. She just glowed with warmth and seemed more than happy to let me interrogate her. After the meal she was dying for me to sample to prickly pear sorbet for dessert, she even said she’d comp it, but I was just too full! Another server came and brought complimentary bread and olive oil for me since they usually give everyone cheese popovers. It was such a nice touch to be brought the bread and then assured that it was ok to eat without having to ask. 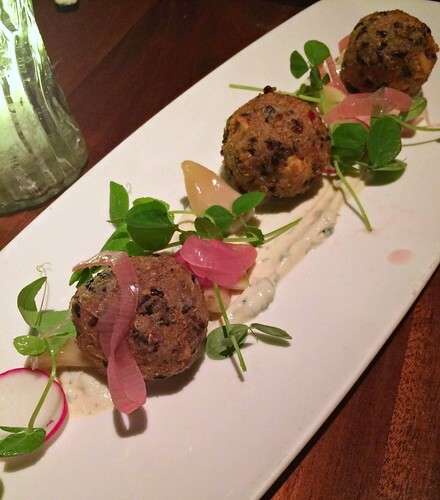 Next they brought the quinoa fritters served with garlic confit, pea tendrils, radish, and tofu ranch. They reminded me of fancy hush puppies. They were light and delicious. But of course the star of the show was the entree. Our waitress recommended the Trumpet Mushroom dish if we were really hungry. It is served with ramps, romanesco cauliflower, quinoa granola, and mojo de ajo. It sounded really interesting but there was no way I could avoid trying the gnocchi. 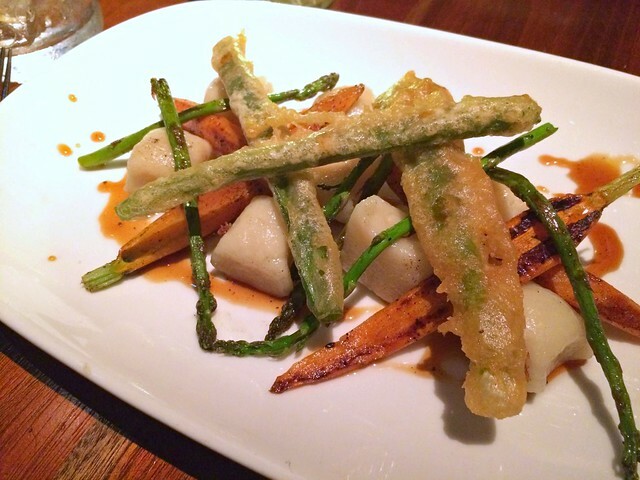 Described as potato gnocchi with tempura scallions, rainbow carrots, asparagus, and garlic gastrique I didn’t quite expect the beautiful dish that came to my table. I loved this dish and I could have eaten it all day. The gnocchi was a bit dense and not the light pillows of perfection that I hoped for but the vegetables were all exactly how I like them and the combination worked really well. I finished with a huge best-meal-ever buzz and I’m so glad that I have somewhere else to recommend for when folks want to dress a little fancy and valet the car. I do wonder if they change the menu from time to time it seemed seasonal but I was eating in late August and between the ramps, asparagus, cauliflower, and radishes the menu screamed spring. 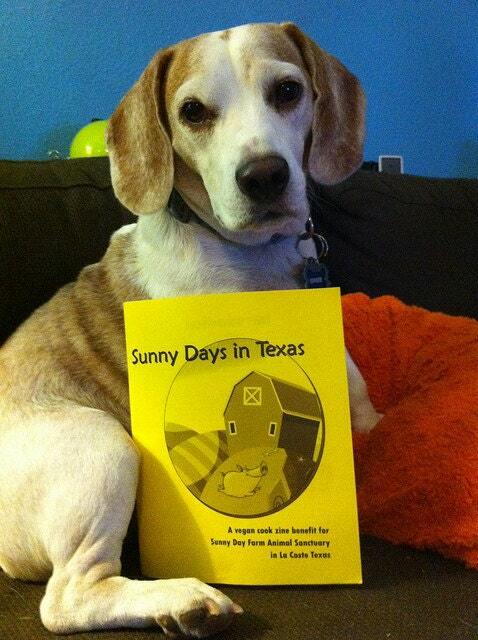 I’ll find out the next time I go….the next time someone wants to buy me dinner (thanks mom!). UPDATE 9/3/2015 Trio let me know that they will be changing the menu for Winter so be there or be square. 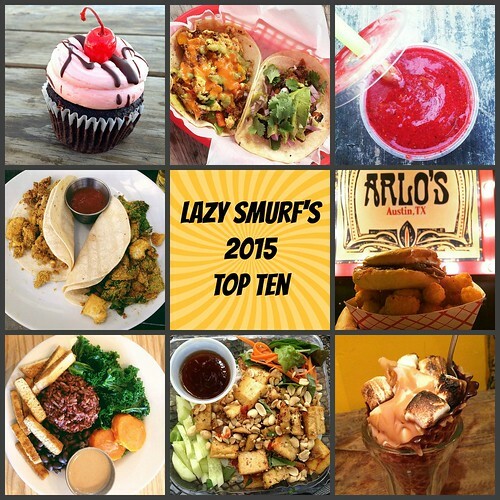 This entry was posted in Austin, Austin Restaurant Reviews on September 1, 2015 by lazysmurf.